And then there was a trouted dinner …. OK, so obviously I am no chef, food stylist nor photographer, but the dinner of vol-au-vents filled with lemon-thyme infused trout mornay tasted quite scrumptious. Yes, I know, self praise is no recommendation – BUT it’s the fish, not my cooking efforts, to which I am giving the credit. 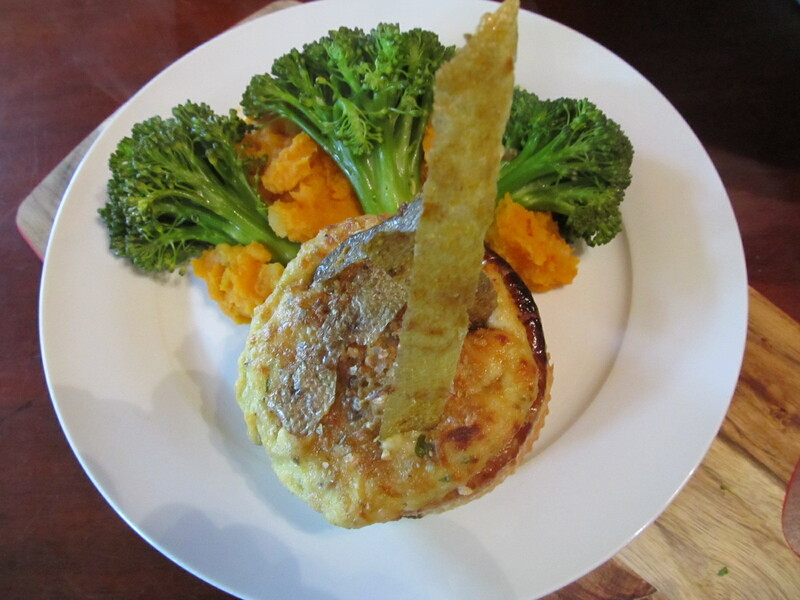 The vol-au-vents were topped with a Manchego and trout crackling crumb, with shards of the actual crackling on top. This is Robert’s dinner pictured here – vol-au-vents being served with a potato and kumara mash and fresh broccoli from our garden. It’s been about 30 years since I actually made vol-au-vent cases, lots of fun, as I remembered today as I baked them. So after a day of self-indulgence in the kitchen, with all the fruit drinks now bottled in readiness for upcoming cooking classes as well, it’s time to face a comparatively boring tomorrow. In the (almost) words of Dr. Seuss: Every day from here to there, paperwork is everywhere.